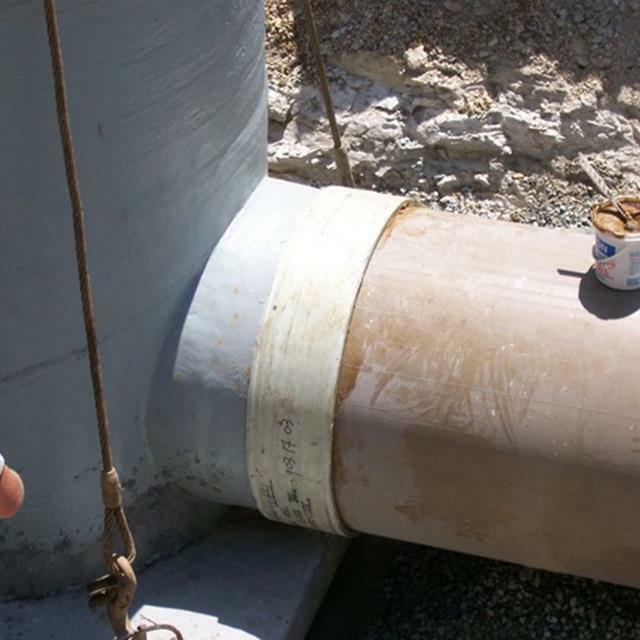 Closed-bottom fiberglass manholes (also referred to as “watertight manholes”) are lightweight, watertight, and corrosion resistant. Their appearance is similar to a conventional manhole with a base, bench and flow channel, riser, reducer cone, and manway opening. Depending on design preference, the overall construction can be monolithic or modular, and have a straight sidewall profile or a transitional diameter profile. A wide variety of pipe connections are available, depending on the pipe material selected. 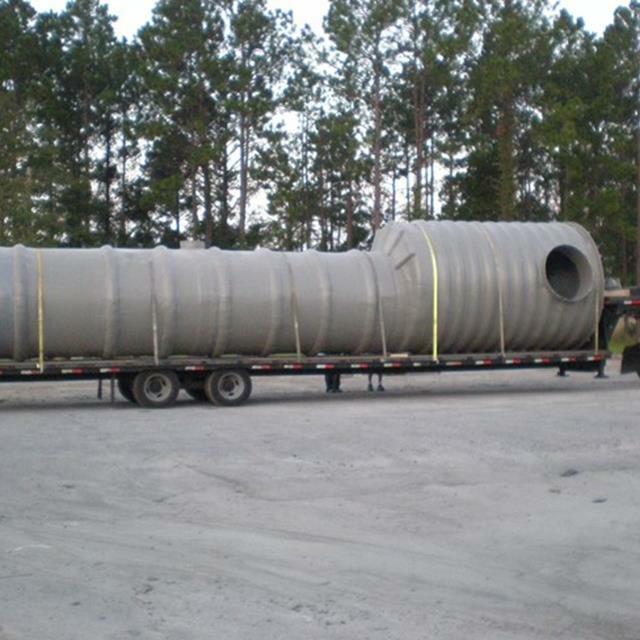 Monolithic closed-bottom manholes arrive on the jobsite as a single structure from top to bottom. 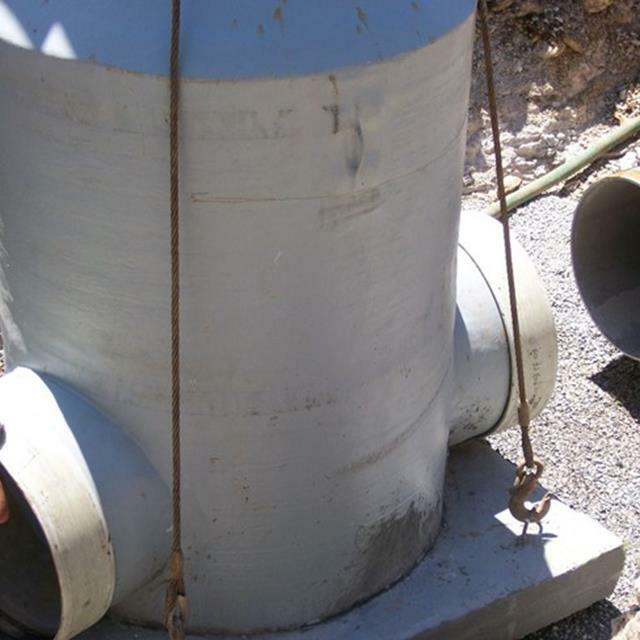 This type of construction provides a “jointless” structure where the only connection points are at the pipe and ring & cover interface. 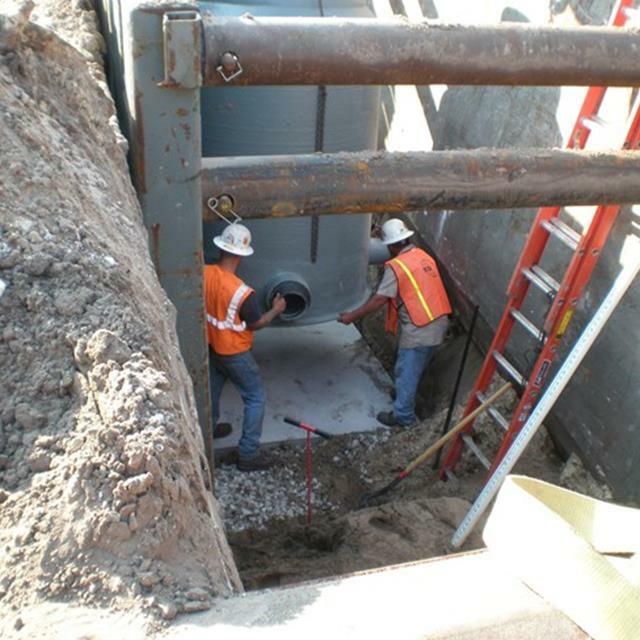 Modular closed-bottom manholes are constructed in two (or more) sections, typically a base section and riser section. The modular sections are joined with two styles of joints: alignment ring and tongue & groove, depending on preference. Each provides a permanently-bonded watertight joint when completed. The alignment ring method is constructed with an internal ring (or internal bell) so that the riser section can be placed upon the base section with the alignment ring overlapping. The sole purpose of the alignment ring is to prevent lateral movement prior to a sealing. The joint is sealed using a fiberglass laminate field kit (provided by LFM). The tongue & groove epoxy joint incorporates a groove joint at the top of the base section. The groove joint is designed to perform as a reservoir to hold a predetermined quantity of epoxy adhesive (provided by LFM). The epoxy adhesive is injected into the bottom of the groove joint in equal amounts around the joint. The riser section (plain end) is then lowered into the groove joint. As the riser section is pressed toward the bottom of the groove joint, the epoxy adhesive is displaced and rises along the sidewall of the riser section toward the upper edges of the joint. Once cured, the epoxy adhesive provides a structural bond between the base section and riser section. 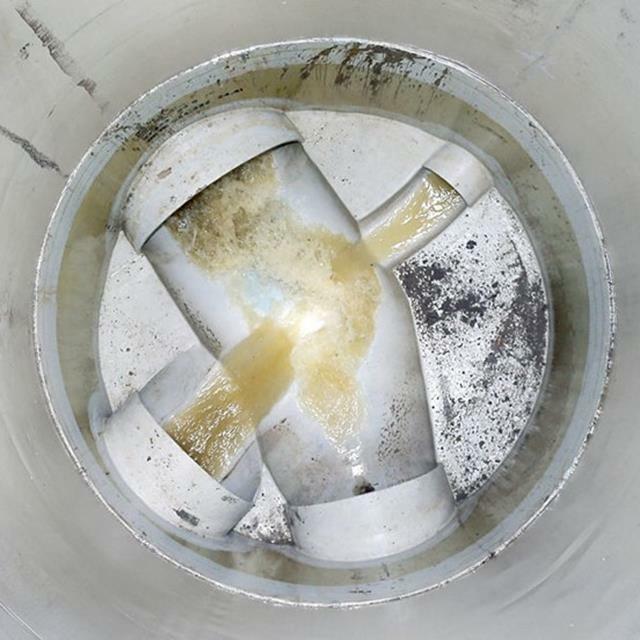 In cold weather, an external heat source may be required to either heat the manhole’s interior or exterior surface to promote curing of the epoxy. 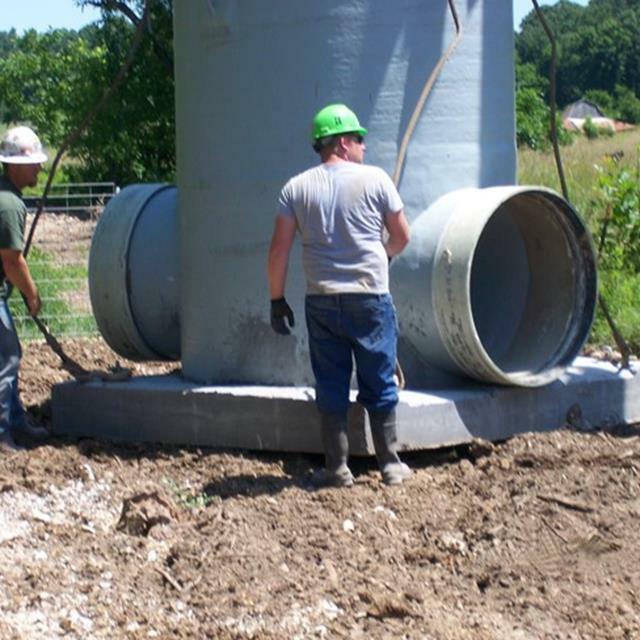 Due to the lightweight construction of fiberglass manholes, concrete ballast may be required to prevent buoyancy or uplift where groundwater is present. 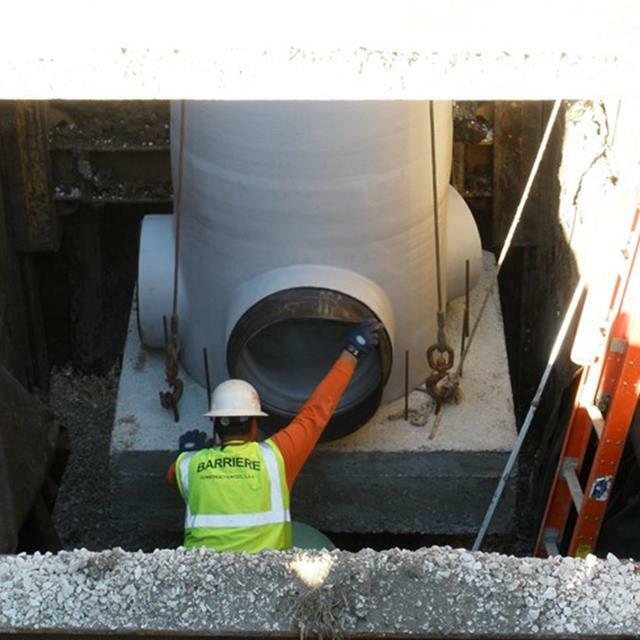 Modular manhole construction allows for steel-reinforced concrete bases to be precast onto the fiberglass base section by LFM. With few exceptions, when a monolithic design is selected, concrete bases are required to be precast at the jobsite or poured-in-place. 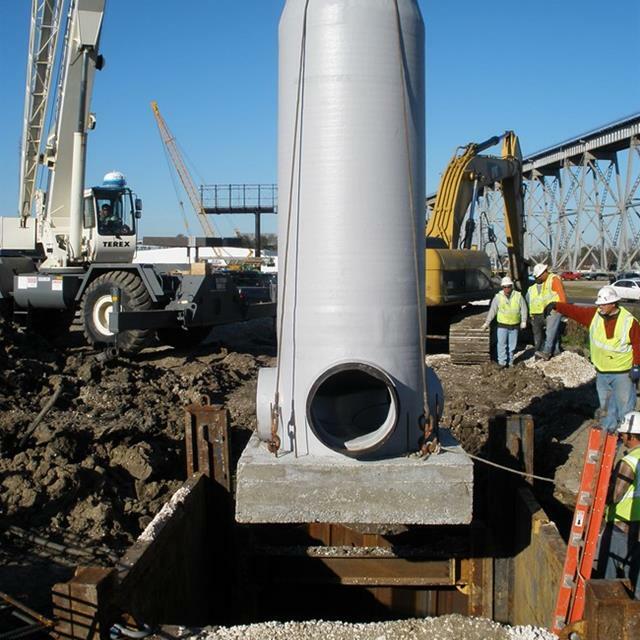 Whether monolithic or modular, both designs include an external base flange along the circumference and external C-channel reinforcement underneath the base that anchors into the concrete ballast. 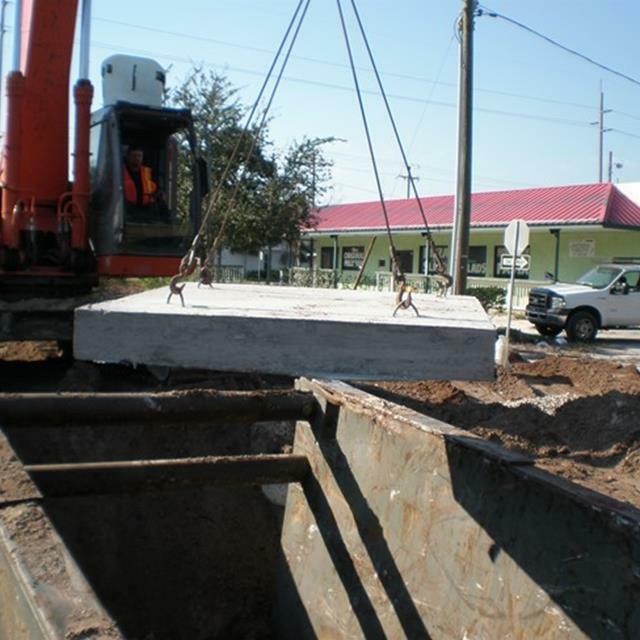 The quantity of concrete required to prevent buoyancy or uplift is dependent on a variety of factors. 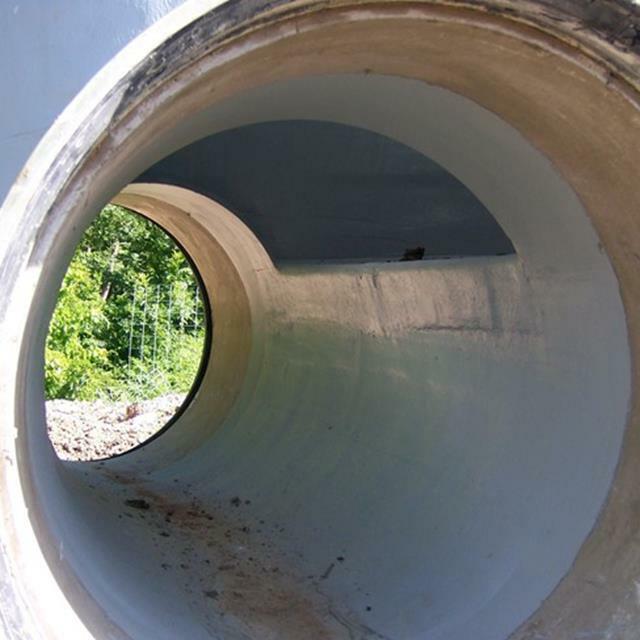 As an economic benefit, closed-bottom fiberglass manholes are available in a “transitional diameter” configuration. 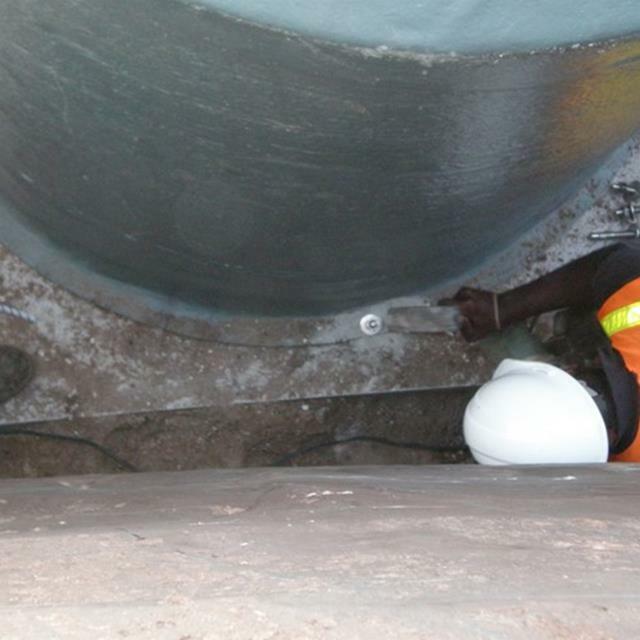 As manholes increase in diameter and depth, the cost of a manhole can be minimized by reducing the diameter of the riser section relative to the base section. 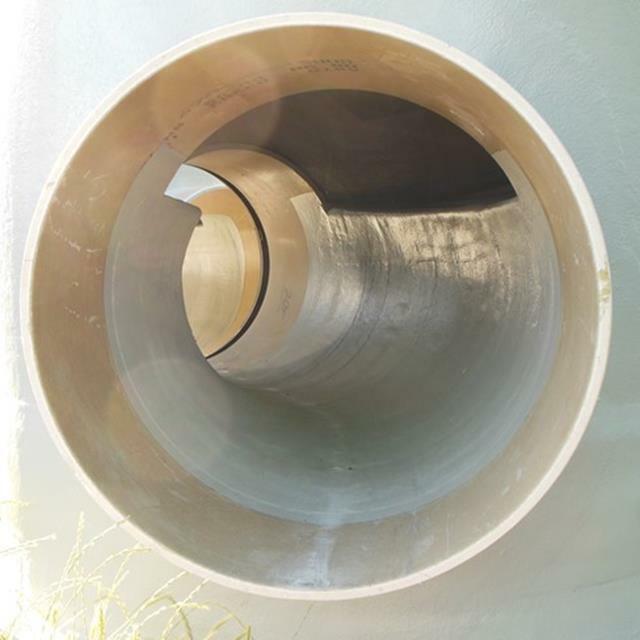 Typically, the diameter of the base section is determined by connecting pipe diameters, number of pipe connections, and directional changes in the flow line. 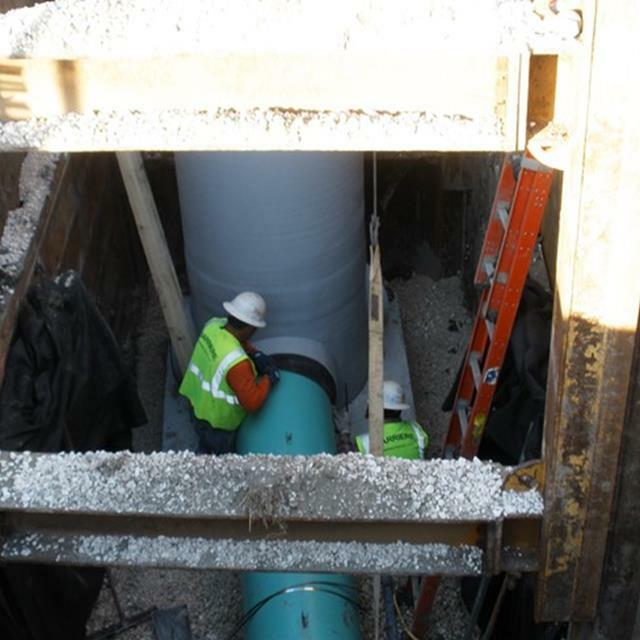 These factors may require a minimum base section diameter of more than 4’ while a transition to a 4’ diameter riser section may be perfectly acceptable. Greater savings will be realized as the difference between base diameter and riser diameter increases. The amount of savings will depend on the required minimum base diameter, desired minimum riser diameter, and total depth. Unless the manhole is greater than 20’ deep, a “straight sidewall” manhole is usually the most economical design. 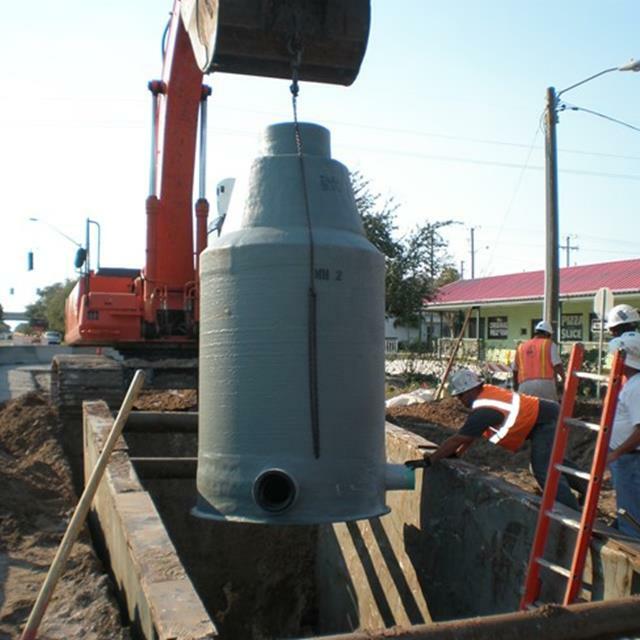 LFM builds fiberglass manholes to your specified dimensions with diameters available from 36” through 14’. Depths are available by the half-foot from 2′ through 40′. 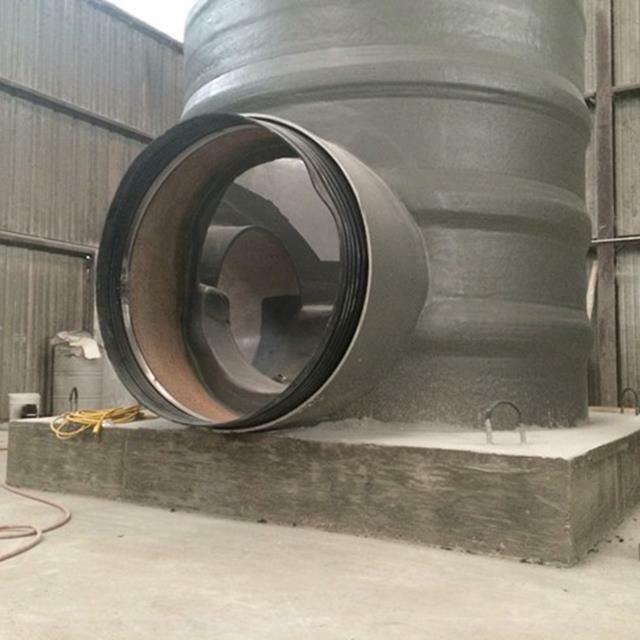 We manufacture several different wall thicknesses for different load, depth, and diameter specifications. Contact your LFM sales representative to find which dimensions best suit your needs. 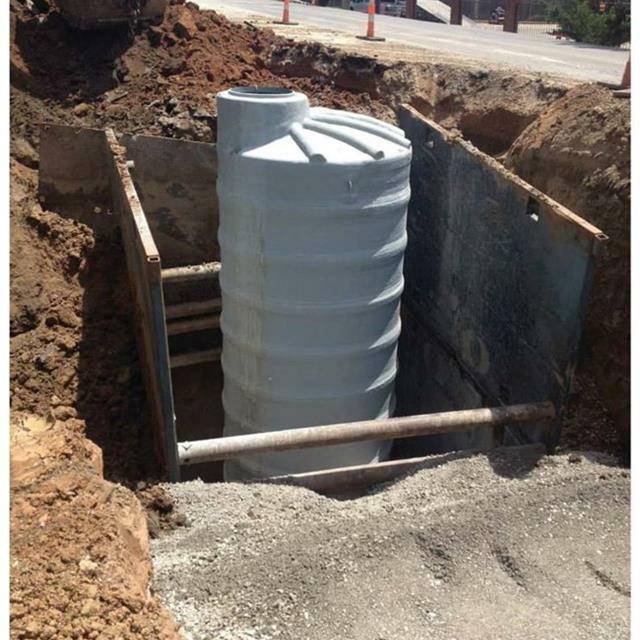 The base of a closed-bottom manhole consists of an integral fiberglass plate to prevent infiltration of ground water. 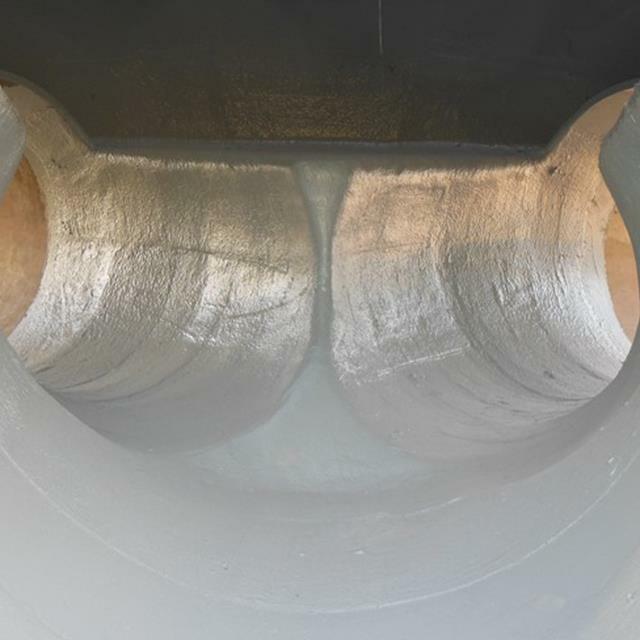 Closed-bottom manholes may be constructed with or without a fiberglass bench and flow channel. If corrosion of the bench and invert is not a concern, brick and mortar or concrete flow channels may be formed in place after the manhole has been installed. 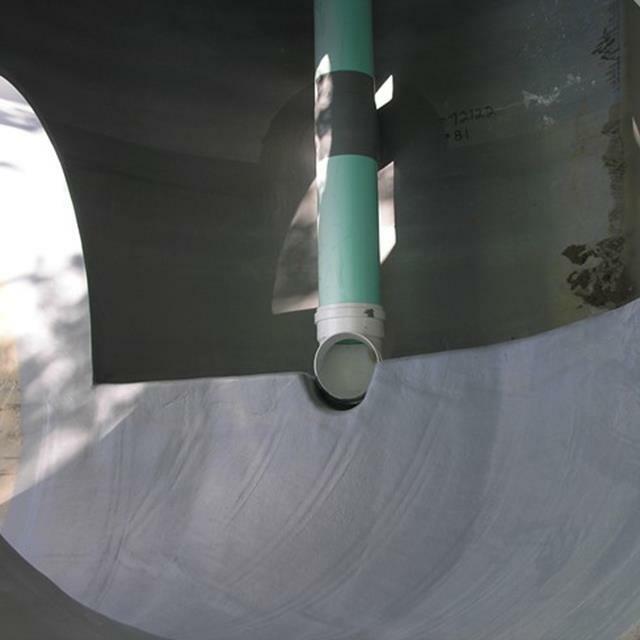 Pre-fabricated fiberglass flow channels can be built as ½, ¾ or full-depth flow channels. For optimal hydraulic performance, fiberglass flow channels offer a Mannings smoothness coefficient of 0.009, and directional changes include smooth-sweep elbows. 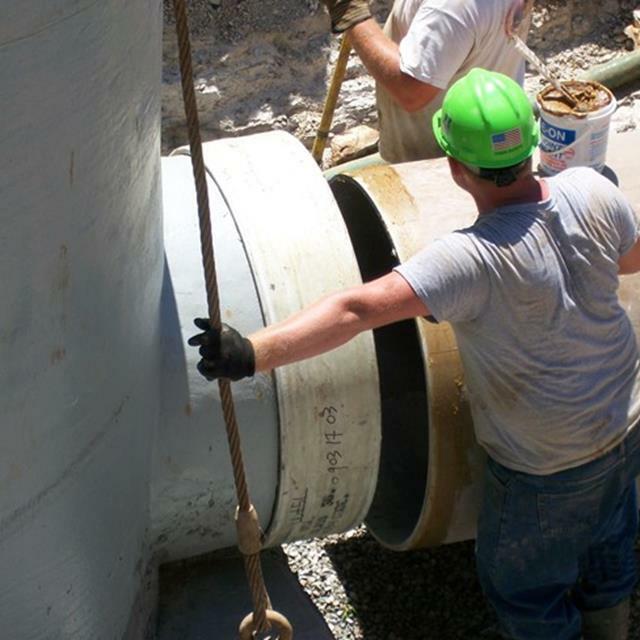 Pipe connections for closed-bottom manholes include fiberglass laminated pipe stub-outs, flexible rubber boots (e.g., Kor-N-Seal©), segmented rubber seals (e.g., LinkSeal©), and flanges. Internal drops are typically pre-fabricated at LFM’s manufacturing facility and incorporate a drop tee or bowl at the top, with brackets anchoring the downcomer to the sidewall and a bottom elbow to direct flow in the desired direction. External drops are typically pre-fabricated with an external PVC pipe stub at the desired elevations. The external drop is then assembled and connected in the field by the installer. The manway opening at the top of the manhole is available in a wide variety of sizes and shapes ranging from round openings between 22.5” and 36”, to square and rectangular shapes that accommodate most hatch designs on the market. Where a bolt-down ring & cover casting is desired, threaded studs may be added during manufacturing or installed in the field. The manway opening typically incorporates a 3” tall neck to prevent lateral shifting of grade adjustment rings or the ring & cover casting after installation. The cone section is available as a concentric or eccentric design. A concentric cone is more popular and the most economical; however, an eccentric cone offers easier access to internal steps and provides for a tri-pod descent onto the bench area. Contact LFM today for technical assistance and additional information. 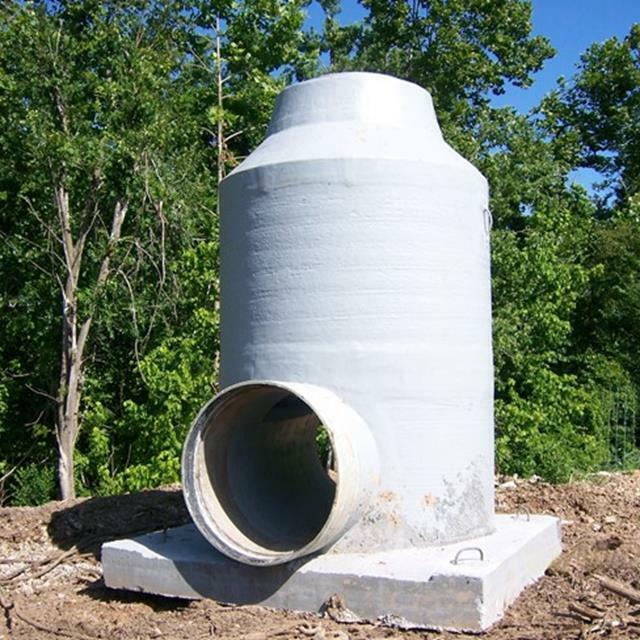 Fiberglass manholes by LFM are designed and manufactured to meet or exceed all ASTM D3753 standard specifications. 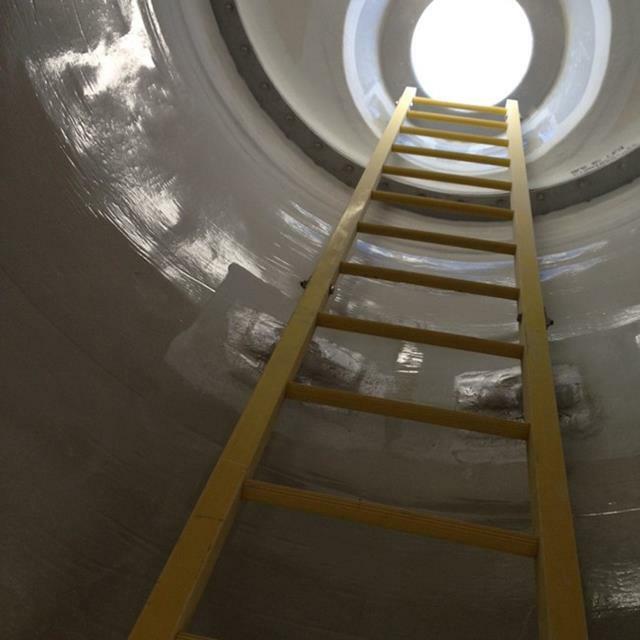 In addition to complying with all ASTM standards, our fiberglass manholes carry an H-20 load rating. Our products are engineered to provide you with long and trouble-free service. Prepare excavation in a normal manner. Be sure excavation has been properly shored for safety. The fiberglass manhole should be placed on 6“of crushed stone or stabilized sand compacted to 95% Standard Proctor Density. 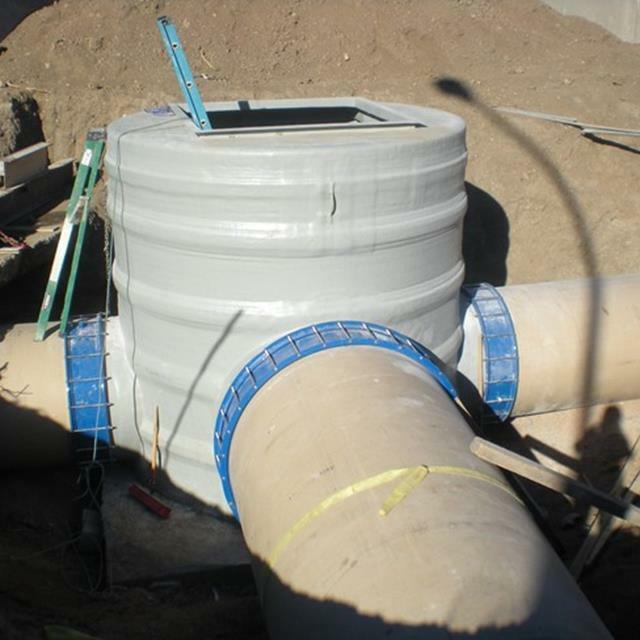 In locations where a water table exists, set the fiberglass manhole on 6” of wet concrete and pour the required amount of concrete on top of the anti-flotation flange to prevent floating. Normal installations require 6” of brick or grade rings be installed on top of the fiberglass manhole. In traffic areas, use a minimum of 12” and not more than 18” of brick or grade rings. Grade rings or brick transfer the load to the outside walls of the manhole. Install a standard ring and cover. 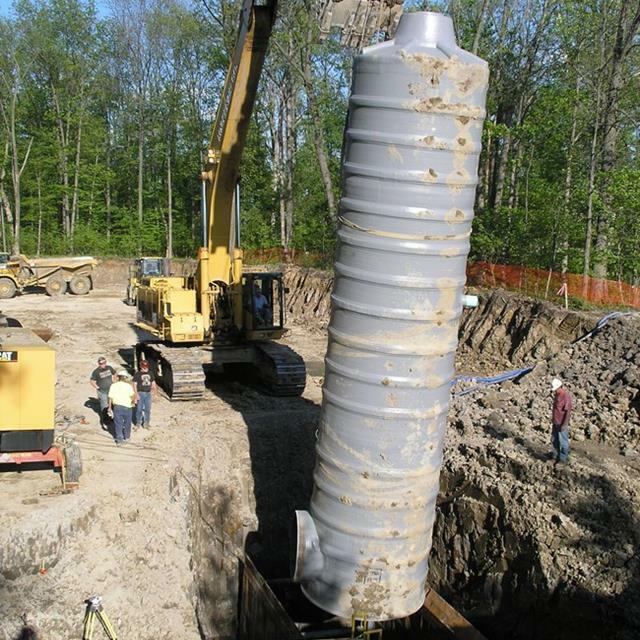 Backfill with screened native material, free of large stones or debris, a minimum of 1’ from the fiberglass manhole wall using a maximum of 1’ lifts. Backfill should be compacted so as to prevent any voids along the wall of the manhole. Always refer to project engineer requirements.